To succeed, any movement must have slogans that “say it all” to communicate an irrefutable message that everyone instantly understands. 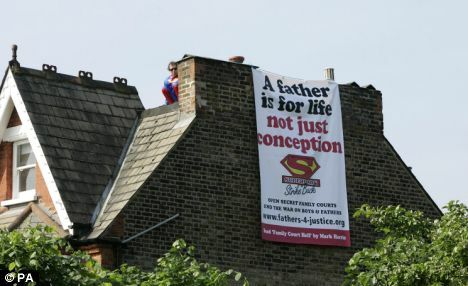 Yesterday, F4J staged another great protest, scaling the home of British feminist minister “Ms.” Harriet Harmon, who has been actively destroying marriage and fatherhood in Britain. For the protest, F4J unveiled the best slogan I have seen in years: “A Father Is For Life, Not Just Conception“. If that does not say it all, I don’t know what does.